A few days before his latest Off-White show was all over social media, designer Virgil Abloh went viral for other reasons. He was signing books at the Paris store Colette, when a fight broke out between some friends who were present — Ian Connor, A$AP Bari and Theophilus London. It was videoed, posted to social media and the hip-hop universe went bananas. The skirmish was pantomime, like something seen on an episode of the TV franchiseReal Housewives. After his strong show, one of those closing the Paris menswear season for SS17, Abloh referred to the fight in his thinking about the collection. “It was the conversation we were having right up to the show,” he said. “How can we find that balance between sophistication and what was real?” He can’t pretend to be other than who he is. His friends are his friends. Sometimes there’s tensions. What you going to do about it? Abloh is one of popular culture’s current big influencers, as both a long-term collaborator with Kanye West and as founder of Off-White, fashion brand in the ascendant. A microcosm case study: Selfridges in London used to stock Off-White in its streetwear section, in line with how the brand first made its name. But Abloh had ambition beyond T-shirts and sweatshirts, and convinced the store to move Off-White to the designer floor. It became one of its biggest sellers, and now has a prime retail shop-in-shop among the conglomerate luxury labels. Not bad for an entirely independent brand. The look at his SS17 show had a particular tension and an evolved roaming eye. T-shirts were transparent, coats were long, trousers high-waisted. One of his inspirations was Oasis, their image on a fake tour T-shirt worn under a black sheer shirt, or Liam Gallagher’s singing face even more screwed up when rendered in an oversize knit. “I’m 35,” he said. “I was born in 1980, and rock music was still the epitome. I still romanticise about a band with character that played instruments that made music.” Abloh cut up and played with Umbro tops taken from a look worn by Liam Gallagher. “I’m pulling these references because they’re an untold story from an American perspective in fashion,” he said. And it’s true, a British designer’s take on the Gallaghers would probably be too literal. “I’m just nerding out,” he said. Maybe he should stop comparing himself so hard, because his work is valid and important, and could fly further if he put on some blinkers and trusted his own instincts. Excellent coats featuring applied images by artist Brendan Fowler pointed in this direction. Already, it’s a thrill to see such a burgeoning high-profile brand engage with ideas of the radical. Of course, Paris also does opulent tradition. Hermès showed a collection of assured luxury: a glove calfskin cardigan here, a cashmere mix polo shirt there. Does Hermès have any significant trouser business? It should, because the body-skimming cut of its cotton and linen pants was fine indeed, some of the best we’ve seen this season. A final run of tie-dyed sweaters, their areas of colour disruption suitably restrained, were very lovely. For his vivid, optimistic and upbeat collection, Paul Smith was thinking about Soho clubs that he went to in the 1960s: the Flamingo, Whisky A Go-Go. “They were all interested in self-expression through the way they wore things,” he said. 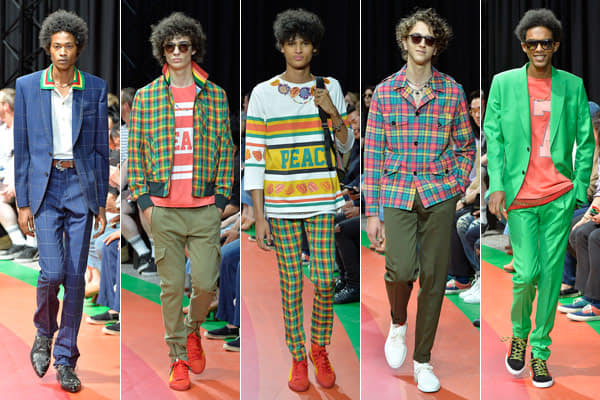 “The collar up, the poseurs standing there, mixing clothes in a certain way.” This meant snazzy suits worn with coloured stripe collar polo shirts, multicolour gingham check safari jackets and blousons, and T-shirts printed with the word “peace”. The show was a happy place to be. Less comfortable was Lanvin, where the air was agitated, as it would be with sneakers that read up the ankle the word “error”. The brand is in a weird bridge period before the debut show of its new women’s creative director Bouchra Jarrar. Lanvin’s men’s creative director, Lucas Ossendrijver, has been there since the days of Alber Elbaz, who was ousted from the brand last year. Ossendrijver pushed deep into a look that was loose, slouchy and often with purposefully naive stitching. Regardless of the incoming austere aesthetic of Jarrar, maybe the times call for ideas that are clearer and cleaner. And so to one of the biggest names in menswear today: Thom Browne. Stores report he is consistently one of their biggest selling brands. Men can’t get enough of his fitted Oxford shirts, or the snug knits with white bands on the left arm. Browne doesn’t advertise or engage in marketing, just relies on strong product that makes men look great. What does a designer with such a solid business send out on the catwalk? Models dressed as birds of paradise, wings, beaks and all. And a shark. The show was preceded by Browne asking for a moment of silence to remember Bill Cunningham, the celebrated street photographer for the New York Times, whose death had just been announced at the age of 87. What followed was the sort of fantasia that Cunningham would have loved, where fashion was used as a vehicle for exuberance and ideas for the hell of it. A model sat under a black palm tree in a square beach of black sand. The music toJawsstruck up, and out came that shark, zigzagging the catwalk around the beach’s edge. 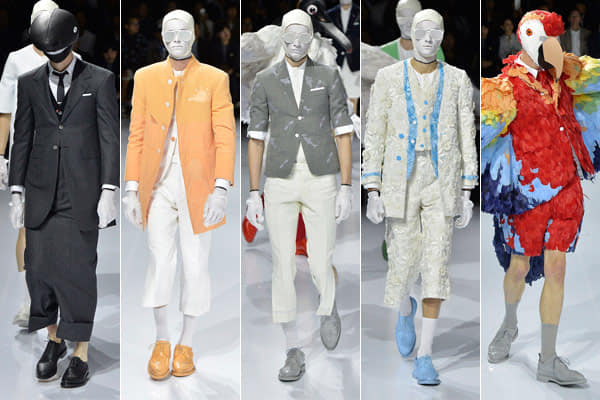 Then came around 40 models in vast volume wetsuits that were a caricature of the Thom Browne suit, with a strong-shouldered silhouette not that far from the one at Balenciagaa few days ago. These were soon whipped off to reveal beneath suits of vivid colour and decoration. Or at least they looked like suits. A long orange patchwork coat had embroideries of sharks and a sun. There was a white jacket beneath, and it was worn with white trousers. All well and good, except when he turned, down the back was a wetsuit zip. Oh, these are all wetsuits too! Turns out every look was a trompe-l’oeil with everything attached in one, a clever catwalk ruse that allowed a display of great commercial ideas. What seemed like a little grey blazer had a plasticised print of sharks and the surfboard out of which it had just taken a bite. What seemed like a short sleeve coat came embroidered with hibiscus flowers. And what seemed like coloured blazers and coats, baby blue or fresh grass green, were naively sweet. These were designs that will easily translate into Browne’s commercial collection, where the clothes won’t all be joined together. Then out came those models in feathered and winged suits. I’m not including this in the list of commerciality. There was more. Once the models had taken their turn, they stood in the middle and stripped another layer to reveal terry towelling swimsuit one-pieces in floral surf prints. Yeah sure, there aren’t that many takers for a towelling floral onesie. But put those prints on a Hawaiian shirt, and in them most men would look fine.